The external control system moves the butterfly valve for air to ignition position. The burner starts at low-fire rate, and a regulator controls the burner capacity via the butterfly valve for air after the operating state has been signalled. The BCU supports the cooling and purging processes. The burner starts at low-fire rate. When the operating status is reached the BCU advises the control unit. 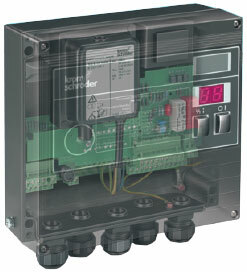 The PLC can now pulse the air valve in order to control the burner capacity. The BCU supports the cooling and purging processes. Inherent consumption: approx. 9 VA plus inherent consumption of the ignition transformer. Output current: Max. 2 A per output, but total current for valves and ignition transformer: max. 2.5 A.
Fail-safe inputs and outputs: All the inputs and outputs marked "FS" may be used for safety tasks. F3: 3.15 A, slow-acting, H pursuant to IEC 127-2/5 (on BCU..C). Housing: Die-cast aluminium with plug-in terminal blocks and plug-in M20 cable glands. Weight: Approx. 5 kg (11 lbs.) depending on version.